A view from the back of the cabin Living room in the day, couch pulls out at night into bed Simple. Decompress. 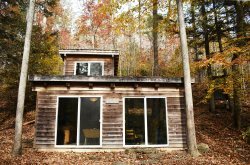 Red River Green Rental Cabins are located within the Red River Gorge Geological area in the Daniel Boone National Forest. To get there you drive through the Historic Nada Tunnel, snake through the national forest and hike in to our off the grid cabins. We have two unique cabins, both of them are off the grid. Peregrine Cabin is a modern two story forest get away with a forest shower and enjoy the backcountry at the fire pit. Or make the Tree House your base for a fun get away where you can find hiking trails and the Red River which has many places to swim, canoe, kayak and fish is only a 1/2 mile away. The Flying Squirrel is a beautiful, brand new, ACTUAL tree house. It is an off-the-grid, peaceful place for adventurous nature lovers. Hike up the trail for 10 minutes and arrive at your room in the trees in the heart of the red river gorge. Enjoy the view from the pull out sofa that turns into your bed and sleeps two. Linens are provided. Embrace the forest from the deck of the minimalist tree house, where you find your kitchen cart that includes a propane camp stove, cutlery, dishes and pans for two people. A French press for coffee with filters can be found in the kitchen cart, too. We provide five gallons of water. You can get more at the spigot by the outdoor shower. Enjoy a fire around the fire circle at night. A composting toilet with toilet paper and sawdust is situated near to the tree house. Bring a good book, games, head lamps, food, drinks, and some hiking shoes. It is easier if you can pack it all into one load. This is the ultimate in off the beaten path relaxation Flying Squirrel is a unique cabin that is the perfect base to your adventure in the gorge. HIKE IN ONLY! (Not recommended for non-hikers or people with injuries). No Pets Allowed, No Smoking, No Children.